The figures above shows dissolved CFC-12 concentration measurements made along the CLIVAR A16 section in the Atlantic in 2003 and 2013, and the 10 year difference in CFC-12 concentrations between 2013 and 2003 (i.e. 2013-2003). The largest increases in CFC-12 are in Antarctic Intermediate and Mode Waters at depths centered at about 1000m from 40°S-20°S and in Labrador Sea Waters at depths between 1500-2000 m from ~ 64°N and 40°N, reflecting the vigorous ventilation of these waters and the time-lag of transport from the outcrop locations to these regions. 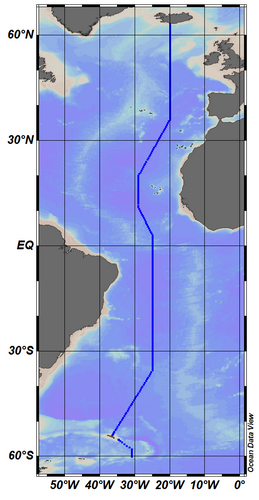 Significant changes are also observed in abyssal waters along the northern end of the section in North Atlantic Deep Water (NADW), along the southern end of the section in Antarctic Bottom Water (AABW) and in mid-depth and abyssal waters near the equator. Map showing CLIVAR A16 section line.